Apple’s iCal ( ) lets you make a calendar available to others by “publishing” it, but subscribers can’t edit your published calendars. And although MobileMe ( ) members can sync calendars among Macs and make changes on any of them, this only works if each Mac is logged in with the member's MobileMe ID. 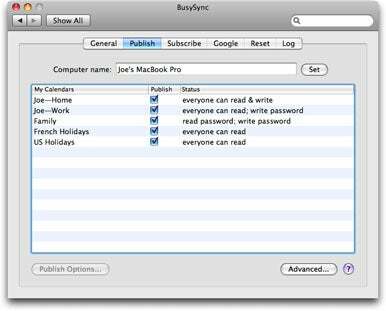 If you want family members or coworkers to be able to see and edit your iCal calendars, BusyMac’s BusySync 2.1.6 may be just the tool you need. It syncs calendars among Macs (with the same or different users), among user accounts on a given Mac, and between your Mac and Google Calendar—in any combination. A given calendar may be connected in multiple ways—for example, you may subscribe to a Google calendar and also publish it on your local network—but BusySync can’t merge the contents of an existing iCal calendar with an existing Google calendar; that requires several manual steps. 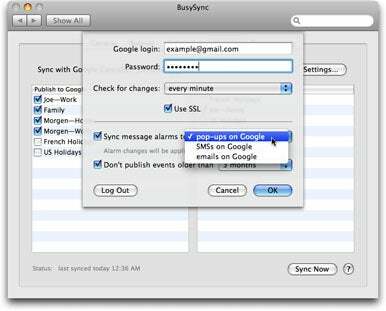 BusySync is also compatible with MobileMe, so that (in theory at least) your Mac, the MobileMe Web site, Google Calendar ( ), and your iPhone ( ) all get updated when a change happens on any one of them. Of course, this requires that you have everything configured just so; that your computer is on and BusySync is running; and that you wait long enough after any given change for two or more separate syncing operations to occur. When you add or change an event in iCal, the change appears on your other Macs and Google Calendar almost instantly. However, because Google Calendar doesn’t notify BusySync when a change has happened on the Web, you must wait until the next sync (which can be as often as once per minute) for the updated information to appear on your Mac. For each calendar you publish using BusySync, you can opt to require a password for reading, writing, or both. Most iCal event data is correctly synced among Macs—including location, notes, attendees, alarms, to-do items, and attachments. However, due to limitations in Google Calendar, some data (such as attachments and to-do items) can’t be synced to your online calendar, and although alarms are synchronized, you must choose a single type of Google reminder (pop-up, e-mail, or SMS) to be used when the iCal alarm is set to “message.” Even then, changes made to alarms on Google Calendar (after the initial event creation) don’t sync to iCal. In addition, if you create an event in iCal, attendees aren’t synced with Google Calendar, so you won’t see the full list of attendees on the Google Web site (this problem doesn’t exist if an event is created in Google Calendar). BusySync’s enhanced publish-and-subscribe model generally works well once it’s configured; but because it relies on the publishing computer to act as a hub, syncing won’t work if that computer is off, asleep, or otherwise disconnected from the network. That means if you have several people sharing a common calendar, the Mac designated as the publisher should be one that’s always on and available. Although you can rely on a Google calendar to be the publisher, you’ll lose the ability to sync to-do items, attachments, and other potentially important data. Among the options you can set to sync iCal with Google Calendar, is the type of Google reminder that should be used when an iCal event has a message alarm. After you get past the initial setup, BusySync 2.1.6 is usually invisible in day-to-day use, and makes calendar sharing for a family or small group as painless as it can be without the use of a dedicated calendar server. For syncing with Google Calendar, BusySync is superior to Spanning Sync, and for directly syncing iCal among users, it’s the best option available. Joe Kissell is the senior editor of TidBits and the author of numerous e-books about OS X.